Stealth announced the LPC-125LPM, a new low-power mini PC designed for embedded and in-vehicle applications. The specifications can be viewed over here. 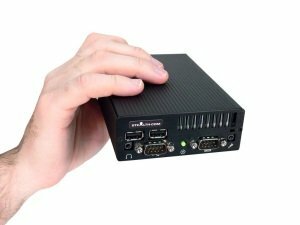 Stealth.com Inc. (Stealth Computer), a leader in the industrial computer and peripherals market has released a new ultra small PC designed specifically for in-vehicle/mobile/embedded applications. Stealth's model LPC-125LPM is a rugged small form PC that operates in extreme temperatures and is energy efficient, drawing less than 20 Watts in operational power. Stealth's embedded mobile PC utilizes the energy saving Intel� D525 Pineview 1.8GHz Dual Core processor technology with two physical cores and four Intel Hyperthreading resources. (two per core) The Stealth ultra low-powered computer provides plenty of performance for most embedded and in-vehicle applications.